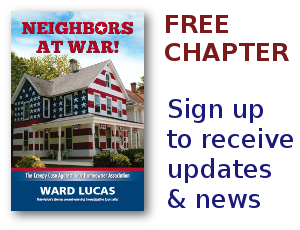 super-priority lien Archives - Neighbors at War! 1 Comment on A Little Less Corruption? Super Priority Liens! You all know how I despise HOA corruption. Actually, that’s superfluous. HOA and corruption are pretty much interchangeable. “You got corrupted?” “You got HOA’d?” See what I mean? But a federal judge has just ruled that sticky-fingered lien-flingers can’t assume a superior position when trying to screw a homeowner and his mortgage company over some tiny violation of CC&Rs. The only problem is that without all those illicit profits, your HOA will just have to raise your dues. Or file lots more lawsuits. Keep your grass trimmed! Don’t let an overnight guest park his car on your driveway! And by golly, don’t display the American flag! Whoa! Is this the Beginning?!? 4 Comments on Whoa! Is this the Beginning?!? There are some scattered court cases which may have an interesting impact on Homeowners Associations, an impact many of us would love to see. From the National Law Review, the West Virginia Supreme Court of Appeals ruled that HOAs are debt collectors. We all know they file liens and harrass homeowners into paying dues, fines, collection costs, attorneys’ fees. But if they’re debt collectors then they have to follow all the laws governing debt collections. With what we know about HOA bullies that could subject associations to huge fines.